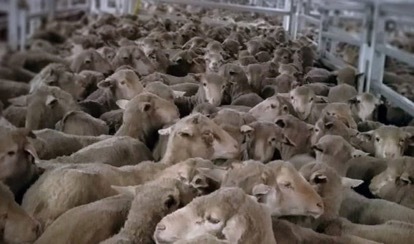 Live Animal Export: Can farmers find an alternative in only 40 weeks? Livestock carriers have the oldest age profile in deepsea shipping. The sulphur cap should ensure many of them find their way to beaches in South Asia soon, writes Dr Lynn Simpson. Another day of ovine gridlock on a sheep ship. No indicators, no brake lights, no problem; nowhere to go. Images like this will soon be historical. Why? New regulations from the IMO that have me looking forward to New Year’s Eve. Get out the champagne! The shipping world is currently fretting, speculating, hoping and bracing itself for the implications of the new IMO regulations to be implemented as of January 1st, 2020. Less than 40 weeks away: about the gestation term of a calf. As a vet I never thought I would have to write about chemistry and physics after graduating uni, but here I am. The new, colloquially termed, ‘IMO 2020 sulphur cap’ is the reason. Based on years of global research, heated debate and ‘big picture’ environmental concern, the IMO will be implementing regulatory standards to ensure ALL ships in the world comply with new fuel emission standards. The ships at greatest risk are likely to be the oldest. The live export fleet is the oldest saltwater fleet in the world, hence most vulnerable. Less than 140 ships in the global fleet of over 100,000 ships registered with the IMO are ‘live export’ ships. A tiny percentage. About 40 are allowed to trade from Australia. The average age of a ship’s scrapping has been about 20 years, the live export fleet has an average age creeping above 40 years old. When the sulphur cap is implemented it is speculated than many of these 140 ships will be headed to the scrap yard beaches in India, Pakistan and Bangladesh. These yards are bracing themselves for a glut of ships to chop up. Any live export ship that survives the new regulations by design or expensive mitigating strategies is not guaranteed to continue trading on its current route. The ships will ‘follow the money’. Any gap left in the EU or other areas may tempt existing Australian trading ships away. Where does this leave the farmers? – Use low sulphur fuel oil (LSFO) or very low sulphur fuel oil (VLSFO). These fuels are being produced in anticipation. Mothballed refineries being rebooted. Its more expensive – that cost will be passed down the chain. There are concerns that this fuel will not be compatible with some if not many older engines – some speculating it may result in leaks and an increase in engine room fires. One tactic to save money is to sail slower, reduce consumption- anyone familiar with live exports knows, more days = more deaths. – Installing ‘scrubbers’ to extract the sulphur content from fuel emissions. Costly and depending on which type is chosen, fraught with further concern. The two types are ‘closed loop’, and ‘open loop’ scrubbers. Many of the older ships will simply find this not financially viable and scrap. The ships fitted with open loop scrubbers are facing growing concerns and limitations as places such as Singapore, much of China’s coastline and rivers, and Fujairah have already banned the use of this system due to water pollution concerns. The closed loop scrubbers are more expensive, and currently have no geographical limitations – they do require the shipowner to store and dispose of the extracted waste responsibly on land- more expense to be passed down the chain, less financial viability to any old clunker on its last legs. So, where does this leave livestock producers in Australia? The UN/IMO have been discussing this change for years, it’s been well advertised, yet our agricultural industry does not seem to be factoring it into their business model. Why? Who has failed to keep them notified? The live export trade is especially ‘on the nose’ in Australia. Allowable stocking densities for sheep are 17.5% lower than historically allowed. The industry itself has a self-imposed reduction (trade moratorium) of 100% reduced stocking density from June through to August due to belatedly acknowledged heat stress risks to or through the middle east during that time. Yet the farmers are still concentrating on the small picture – their own interests. Why haven’t they been told the big picture, the true ramifications to their business? There have been attempts to ‘improve public perception of their image’ of late, by an amusingly named group calling themselves ‘The sheep collective’. Dictionary definition = mob. Why try to improve the image of a trade that is about to lose a huge transport capacity? Why not help them transition away from a dying trade? Live export of animals by sea is experiencing massive, sustained, and growing opposition globally. The likelihood of scrapped ships being replaced is slim at best. With a growing acceptance and desire of imported chilled, frozen and diverse meats such as chicken- many of the traditional importing countries are already moving on. To add to Australian farmers woes, on January 1 ,2020 new Australian Maritime Safety Authority (AMSA) regulations will see the end of double tiered decks. This will of course halve the carrying capacity of those decks. The Department of Agriculture has this month announced the requirement of electronic temperature loggers on livestock decks, all costly- again the cost will be passed down. Reduced export destinations will mean increased welfare scrutiny. Hopefully a higher welfare outcome, however; more likely an increase in non-compliance exposés. More scandal and damage control pressure. The global live export trade is likely to be turned on its head. No longer will orchestrated demand, drive supply of live animals – carrying capacity will. Its time for any sensible farmer to begin lobbying for onshore processing of their animals as close the point of birth as possible. Lobby for new infrastructure that is not at the whim of global shipping trends. Future-proof their operations and finally get some security for their animals welfare and business reputations by moving away from live exports. This New Year’s Eve will be a game changer. Thank you Lynn for this well researched and BRILLIANT ARTICLE and for the time you took to publish this important information. OH HAPPY DAYS are so close for this (me) 79 year young activist who’s 20 year old quest is to help shut down the live export industry, may finally be achieved before I fall off my twig.